Since you’ll already aware of the past and present, it’s time to understand the past, present and interpret this into the future. In the assignment section you’ll find different tasks to help you understand and reflect about these subjects, topics, cases and examples. 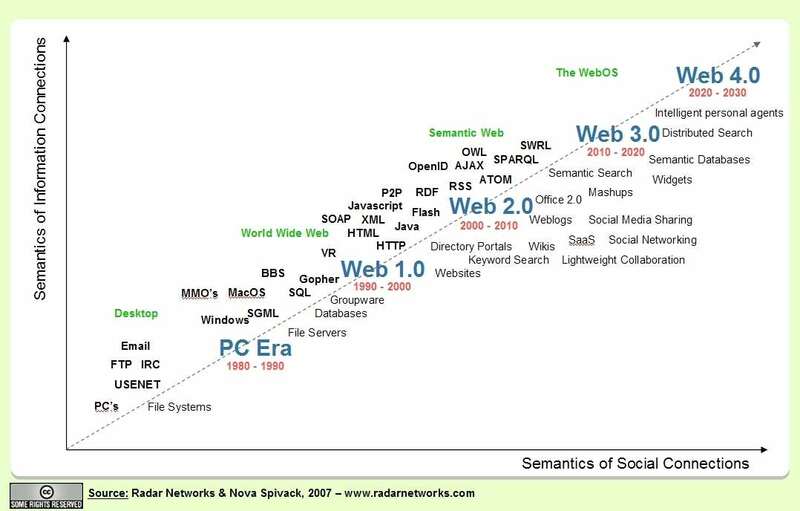 And it won’t stop, so we have to look into the future…where we can see Web 4.0 already on the horizon. Seth Godin discussed it already on of January 19, 2007. Side by side with the growth of the web, we see the web evolving in terms of semantics of information connection and semantics of social connection. This graph (published in 2007 by Seth Godin) is also a work in progress, but gives a great idea of the fast evolution. Together with the growth and size this is someting to take into account when you talk about e-business or the flat business. In a reaction to this graph Michaël Belanger writes on February 10, 2007 the following reaction: The WebOS is 95% about rich media content. […]This final step – using conversational style requests (over a cell phone or keyboard) will provide total information awareness associated with the “roll” of the user – as derived on the fly from the full context of the request’s information needs. Only relevant knowledge will be considered and the more contexts in the request – the more highly personalized will be the returns-ranking. These returns will be a “collage,” ranked by fit-to-context, of image segments, fragrances, text, structure segments, music segments and all forms of knowledge with precise contextual relation to your on the fly the needs – fit to your “user’s roll” of the moment. […]. The semantic web available through interconnective media (see my blog: Interconnectivity…), and this will be the near future…. In this part, there will be an easy step-by-step framework in which the Flat World Business will be developed. Let talk about e-business vs e-commerce, because there is a lot of confusion going on. What’s it all about e-business? When do we talk e-business and when do we talk about e-commerce? Be shure you have your terminology straight, after visiting Flat Business vs E-Commerce! 3 business case are describing the typical business evolution from the Web 0.0 to the Web 3.0. What where the challanges, and how did they cope with this new Flat World Challange? Going through the Apple, Amazon.Com and Webvan case, you will notice why and how some companies are winners and others are casualties of the Flat World. Do you know Jozef Schumpeter’s creative destruction? It’s something to think about when you are thinking about a flat world business. Creating a flat Business deals with the different steps you can (and not should!) take when are considering a Flat Business. From the different business models, to the future trends and the key factors of a succesfull Flat business should help make your idea reality. I’m working with the Alexander Ostenwalder’s business model innovation-proces to develop a canvas of your flat business idea. ‘Socialnomics’ diserves a special part in this intensify section, since this will be of huge importance when you are setting up your Flat Business. How do Social Media interact with your Flat Business? What’s the effect of social media on your (Flat) Business? How do you make social media a part of your (flat) business (model)? How legal is the Flat World? Which rules are applied? And how is your and your clients privacy regulated? Just a few questions for the Legal department!